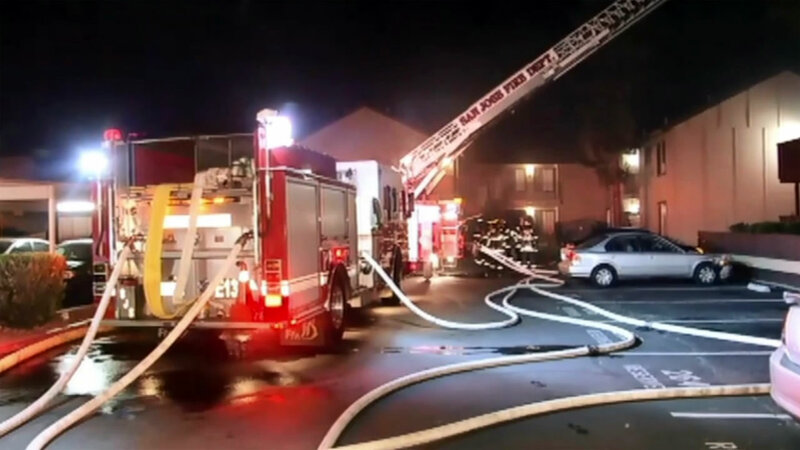 SAN JOSE, Calif. (KGO) -- Officials said 37 people were displaced after a fire broke out at an 8-unit apartment complex on Walnut Blossom Drive in San Jose early Sunday morning. The fire was reported at 3:30 a.m.
San Jose fire officials said a resident heard an explosion and then saw the roof on fire. The Red Cross is helping those who were displaced by the fire. Officials think it's possible that a heater sparked the fire. "One of the residents I spoke with reported a loud explosion sound and he noticed fire from the roofline area," SJFD Capt. Peter Caponil said. Nobody was hurt. It took more than 50 firefighters to put out the flames.